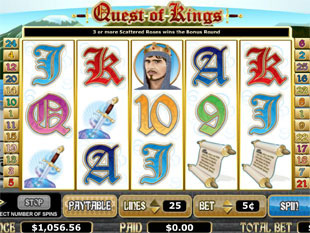 Quest of Kings Slots is an animated, video slot machine game with a Knight theme. It is a five reel, twenty-five payline game. You can bet one coin per payline and anywhere from $0.01 to $20, and you can bet up to $600 on one play. The jackpot is 8000 coins, and the second highest jackpot is 1000 coins. The wild symbol in this game is the Princess, but she does not substitute for the scatter symbol or the Knight symbol. The Red Rose is the scatter symbol, and if you get three or more of them on the screen at a time then the bonus round will open. The screen shows you five towers, and you have to pick three of them, looking for the princess. If you find the Princess you will receive a random bonus, and if you do not find her you will still receive a consolation award. The Knight symbol triggers a special feature when it appears on the middle reels (reels two, three and four). After the game pays out then all of the Knights will turn into Princesses and pay out even more. Other symbols in this game include Swords, Scrolls, and Crowns as well as some playing card symbols.